Steiff World Wide Editions 1996 till 1999. 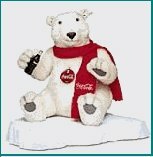 This bear is made in license of the Coca Cola company. In Europe the are wonderful ads with this bear and his cub. He is 35 cm./ 14 inches tall and limited of 10.000 pieces world wide. 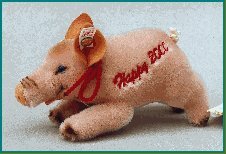 This pig is limited till the end of 1999. This bear has been made to celebrate the beginning of the new Millennium. He is 40 cm. / 16 inches tall and limited to the end of 1999. In total there are made 16.800 pieces. There are 2 bears in this set. The red one is the sun set and the blue one is the sun dawn of the new millennium. They are 20 cm. / 8” tall. They come in a book and were limited to the end of 1999. In total there are 8.890 pieces made.